What they do not tell you about your Chinese zodiac animal, allies, secret friend and conflict animals. How you can help protect and enhance your luck using your secret friend. 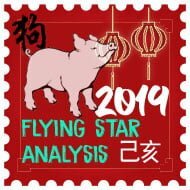 In the Chinese zodiac twelve year cycle, each year has a different Chinese animal sign, and those born in that particular year are said to inherit the characteristics of that Chinese zodiac animal. 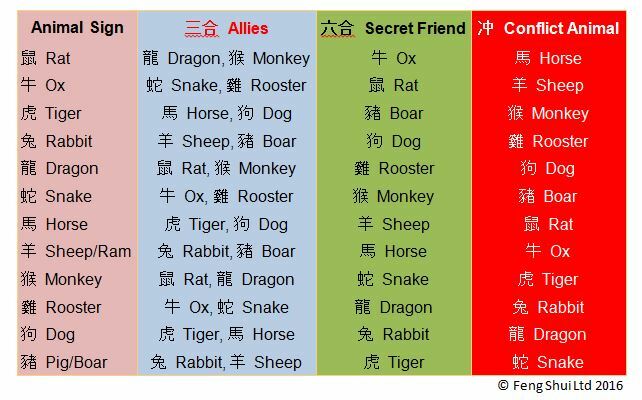 These animals, in order, are the Rat, Ox, Tiger, Rabbit, Dragon, Snake, Horse, Sheep, Monkey, Rooster, Dog and Pig and this valuable document will reveal your secret friend, your two allies and your conflict animal. So to try and harness your horoscope secret friend, carry this horoscope ally talisman with you wherever you go. You can also place this lucky charm in your car, office or beside your bed. Doing this is said to help improve luck and success and help you avoid many problems, even if the horoscope prediction does not look good one year. Your zodiac secret friend is said to give you give you the power and energy to get through these tricky times as well as enhance your luck. 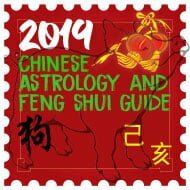 Every authentic Feng Shui Master and consultant will recommend this and it is something I have done as far back as I can remember, personally I have a gold plated Chinese Animal protection Talisman in my wallet, one in my car and one beside my bed. I have shown an example below. 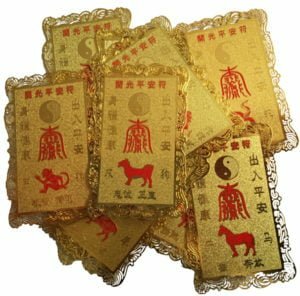 You will notice from the graph below your Chinese animal will have two allies and these are also someone who are said to protect and enhance luck although a secret friend is someone you can always count on and will always protect and you should carry this talisman card close to you at all times. Note that if your animal sign is yang, your secret friend will be yin and if your animal sign is yin your secret friend will be yang. Every Chinese animal will have a conflict animal, as you can tell at the first sight, is the opposite of what your allies and secret friends are. These are the animals directly opposite to you on the compass. We offer an online report that goes into a lot more detail on the Chinese animals and their relationship with others along with much more information. I’m earth dragon man married to a fire rabbit woman. We have a 7month daughter earth dog. My wife and i love each other but she’s not so into making love in the bedroom as I am what’s the secret ? also how will our relationship be with our dog child parental wise ? I would suggest taking a look at the two links below as these can affect relationships, good and bad. The Dragon and Dog could clash at times although patience and understanding can make things work. The Rabbit and Dog should have a close bond. My husband is an Ox and I’m a Snake. Would a Pig baby be in conflict with us? We’re debating between a Pig baby (2018) or Rat baby (2019), then hoping to have a second child in Ox (2021) year. Should we aim for a Pig baby or Rat baby? What’s better? The relationship with an Ox, Snake and Pig will work well. I’m a earth snake and my partner is a fire rabbit. We are thinking of having a second child in 2019. My first son was born as fire monkey in 2016. Should I wait to? The hardest part of this relationship whether business or love is their inability to agree on anything. Although can work if you both work hard at resolving your apparent flaws. Dragons can get along fine so I would not worry about this. I am a rabbit, and I was told to keep a jade horse with me. However, it is not my secret friend or ally. Please tell me why I was recommended to keep a horse with me. The Rabbit should carry a Dog Protection talisman. I’m not sure why you were recommended to use a Horse charm, I’m afraid. Please help me what animal sign should I keep, since me and my longtime leave-in partner,were not compatible with each other’s animal sign. I’m Ox,and his a Sheep ! His an attitude kind of a man to his partner,but i love him . I pray hard to keep my love and the relationship ’til now. If you love someone, you can make anything work, even if your two animals are not compatible. As an Ox, your most compatible animal is the Rat. I hope this helps, Melinda. My boy friend is fire sheep born on 1/2/1968 and I’m a Metal dog born on 8/22/1970. What can we carry or place in the house to get along well? We are having difficulties understanding and communicating. Here is an extract from our Academy software – In a romantic relationship, these two animals may seem to find the future a bit challenging. The Goat will admire the Dogs affectionate ways but they may find it hard to build a good relationship at times. Both of these animals can be worriers and will need a more laid-back approach in order for their relationship to blossom. I would recommend carrying your own personal protection animals on you both. hi! is it a good idea to put a tattoo of your secret friend? mine is rabbit and my bf’s horse. for the horse they say if the front feet is up it is lucky. is it true? I can’t see it doing any harm. I guess it would be similar as having a keyring of your protection animal! Yes, the Horse with raised feet signifies luck. Hi, my zodiac is a rabbit but had given birth to a rooster boy. What can I do to avoid conflicts with my own son and not let this conflict animal affect our relationship? Most books will tell you this combination will never work. Although in our opinion in more mature relationships whether personal or business they can make this work but hard work is needed on both sides. The biggest problem to overcome is the fact that Roosters arrogance will aggravate the Rabbit. It can be challenging at times but when you are aware of potential problems, you can both work hard to overcome the problems. Is it bad luck or does it have the opposite effect in this case? For some reason. Could you please explain what you mean by a user account? Although the Snake will be in conflict with the Pig, you should not see problems with childbirth. 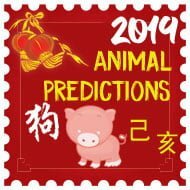 I am in the process of writing the 2019 animal predictions and will be publishing them in November so be sure to check back. If you are flexible, it may be worth waiting until the year of the Rat although I would not let it bother you too much. I would display them in your main living room or at a desk if you have one in your home. They are best placed where you spend the most time. My Secret friend is a Dragon, anyone knows where I can find dragon meat for breakfast. Hope 2018 l will be able do a bit if renovation? I am born in year of horse and i have 3 bosses who are born in year of Rat, Ox and Rabbit. I am afraid we will clash at work. No matter what I do, my actions will always be seen as no good to them. What can I do do to mitigate this incompatibility? The best thing you can do is to read up on their personalities and try to pick up on their hobbies, interests, and strengths to connect with them. My Dad and I are both in conflict with each other’s Chinese Animals and have a great relationship so I would not worry too much about this. Good luck with the next steps of your life, Andy! Rabbit here! I’m glad to say I’ll be celebrating 9 years together with my sheep. My brother a Dragon his fiance an ox. I enjoy these sites and I appreciate you staying not to take it extremely seriously. I know some can. Thank you! Our secret friend is Boar, Please advise do we eat them for our daily meal. My meal always consist of pig meat. This would not cause a problem eating pork although this also comes down to personal preference. I totally agree about opposite zodiac signs being each other’s worst matches. My bed is all mirrors?? ?my front Door is straight to the back door??? Ideally, you should cover the mirrored areas for the bed up if possible. For the front and back door, I would recommend placing something in between to slow the flow of energy down. 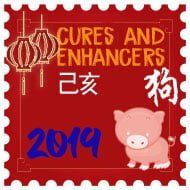 I placed my cures and enhancers as directed (or so I thought) in February. I was having difficulites before placing my kit out, and things only got worse. Then one night I couldn\’t sleep thinking about a enhancer my husband moved, so I got up to fix it and for some reason went back to reading the instruction sheet only to realize I had placed a few cures and enhancers incorrectly. I immediatly made the correct adjustments and I couldn\’t believe how quickly some negative situations I was in improved, drastically! I hit a minor snag with a issue now and my first thought is one of my cures must have been moved!